Our Owner and Director, Michael Bischof, met with Christ Church Primary School in Manchester to discuss plans to implement a designated MUGA Pitch(Multi Use Games Area) to their current outdoor play space. 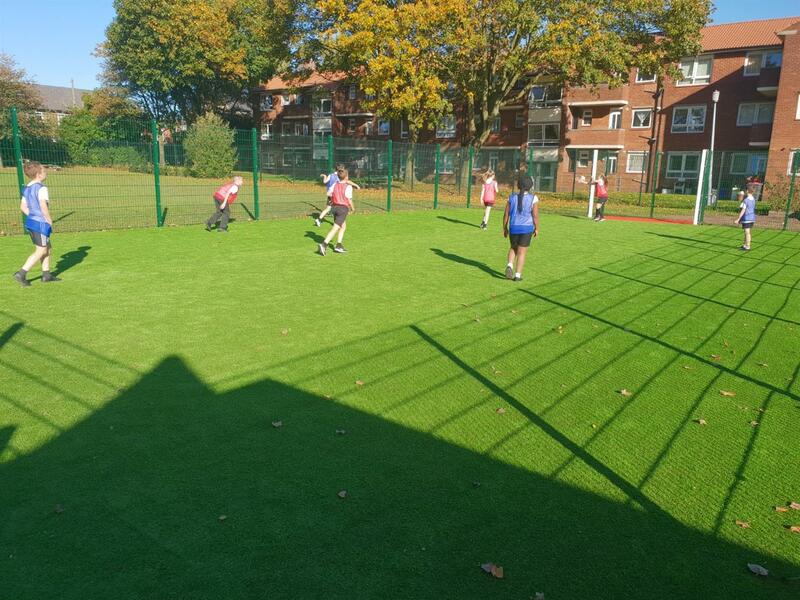 MUGA’s are ideal to encourage children to participate in sports during break times, PE lessons and after school. After the initial meeting, Michael designed an all-weather proof MUGA Pitch to meet Christ Church CE Primary School’s requirements. 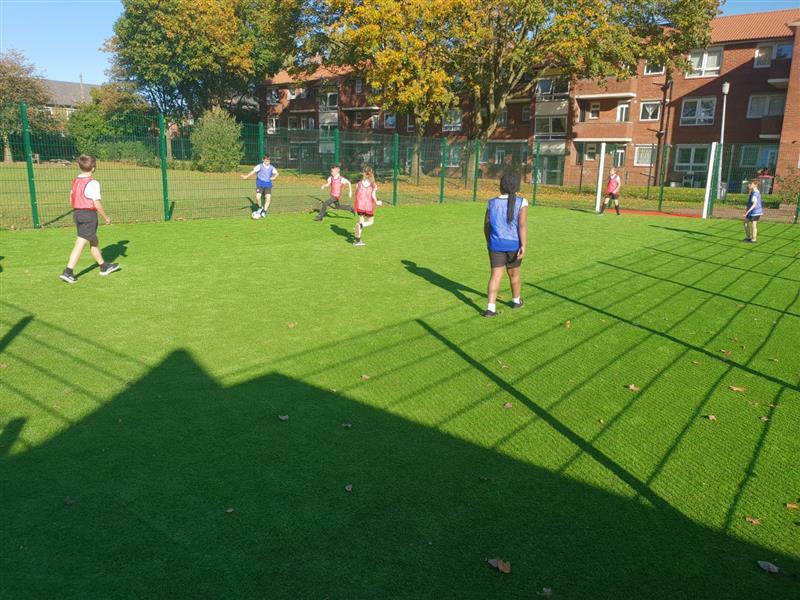 An enclosed, 20 metre x 12 metre MUGA was created using sumptuous artificial grass for the surface to allow it to be used all-season. 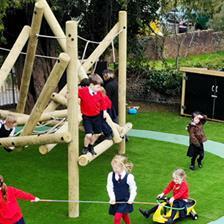 The turf is sand-filled to ensure children’s safety when in use; this is a vast contrast to children playing sports on the concrete playground and on the field when the grass is wet and muddy. 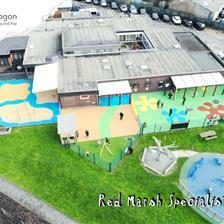 As a result, the children and school can expect more active play with less cuts and scrapes as well as less mess. 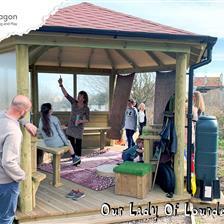 The area is segregated from the field and playground with a robust and sturdy 2-metre-high, steel fence in bottle green. Following Christ Church Primary School’s specifications, we formed an attractive entrance pathway in cobalt blue using saferturf from the playground leading to the MUGA. 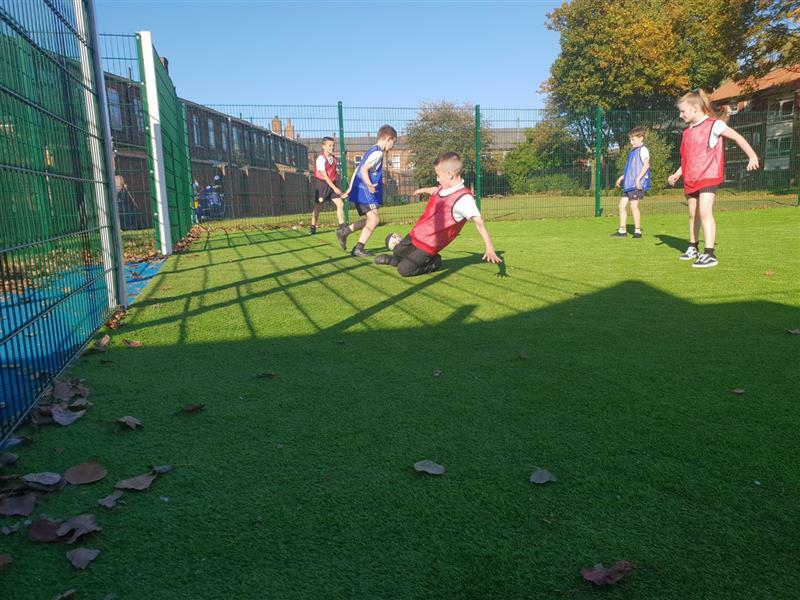 The addition of recessed goals and robust goal posts at either end of the MUGA, help children to polish and perfect their co-ordination. We created goal areas in red and blue to allow children to effectively chose teams for their selected sports. 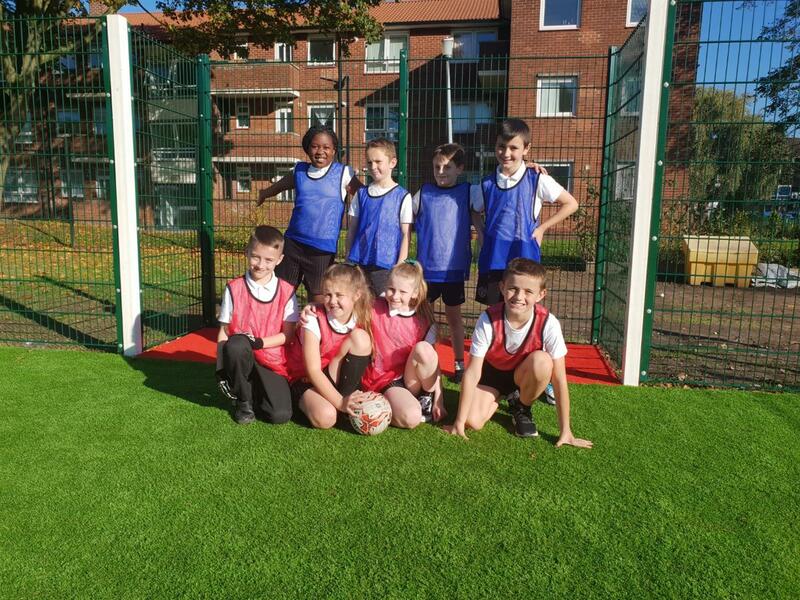 The spirited children at Christ Church CE Primary school are thrilled with their new mini MUGA and the school couldn’t be happier. MUGA’s are a great addition to school outdoor play area as they create a designated region for children to hone in on their sports skills. 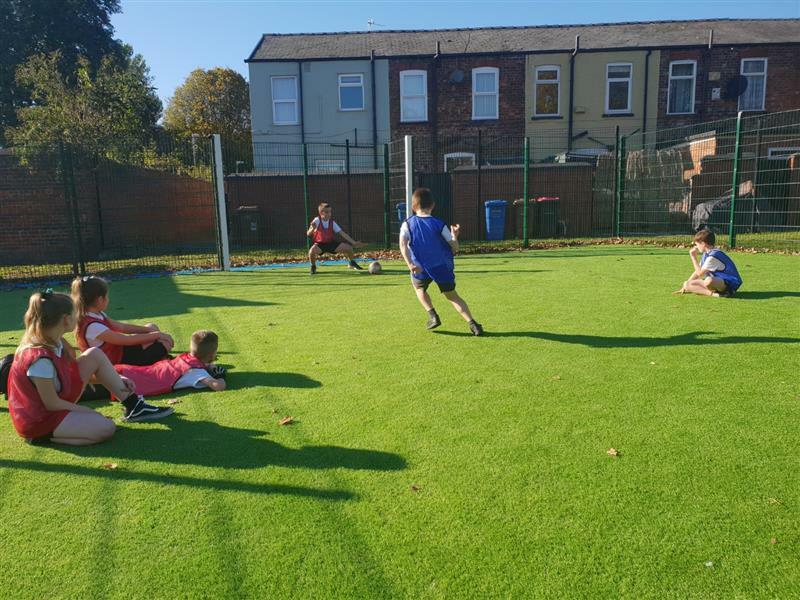 The school can use them for PE lessons, sports practise and create an additional revenue stream for the school by loaning the pitch out to the community (when it isn’t in use). Pentagon Play are leading experts in creating Muga Pitches that satisfy a wide range of sporting demands. If you;re looking to cerate a dedicated space for sport, Contact Us for specialist advice to see how we can create a picture-perfect MUGA to meet your requirements and financial budgets.